SoundSoap+ works as a plug-in inside your favourite media editing application or DAW, and on its own with the included standalone application for Mac or Windows. Discover more about the new enhancement and restoration controls included in SoundSoap+. 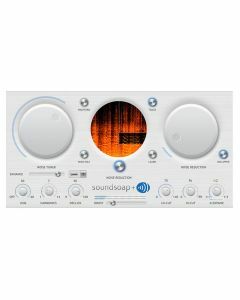 Same as SoundSoap 5 with the following extra features; broadband range, downward expander, additional tone enhancement controls, harmonic hum removal control, and high/low cut filters. Control the range of frequencies where broadband noise reduction is applied â€“ great for reducing artifacts and surgical placement of noise reduction in the spectrum. Click on the Wash Window to control the frequency range used for broadband noise reduction. SoundSoap+ provides several additional tone enhancement controls for the multi-band compressor so you can have more control over which audio frequencies you want to bring out â€“ great for enhancing vocals and action camera footage. SoundSoap+ offers a control to cut high frequencies â€“ useful for eliminating hiss and other high frequencies issues. You can also control the low-frequency cutoff for controlling rumble and other low-frequency issues.